1 1/2" = 38mm Wide. Antique silver roller buckle. 7 belt holes for a better fit adjustment. Vegan leather belt. Snaps for interchangeable buckle. One matching loop. 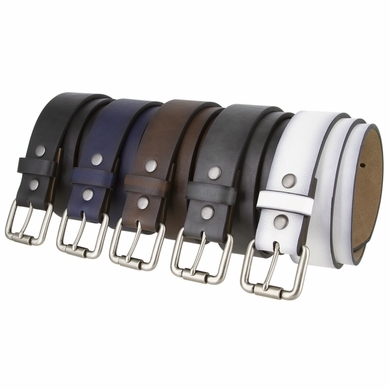 The belt comes in multiple colors. Belt is measured from where the leather ends at the buckle end to the middle hole at the tip end. In order to get your size, measure a belt that currently works for you from the fold where the buckle is to the hole where you wear the belt. That size in inches will be your belt size just round the number if you get an odd number.